I can’t say for sure that’s what Peter Vollers said to his wife, but that’s what he did. I have a better shot at getting my wife to commit to 6 kids after 40. Or to want that. Thank You Peter and the whole Overland race staff. Incredible production. We as a cycling people are lucky to have you. 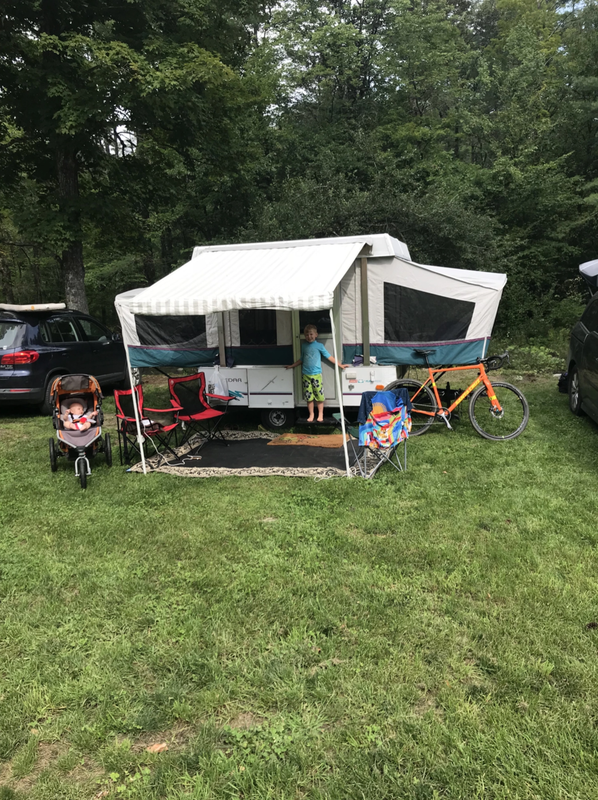 The 2018 edition of the Vermont Overland was my third time. It has become a family affair. What started as something that made me fall back into love with cycling has turned into a yearly ambition. At my first edition my son was one and a half and my wife watched him while I raced. The next year, both my pregnant wife and I raced while my parents watched Sam. This year we had a small pile of kids in a camper. 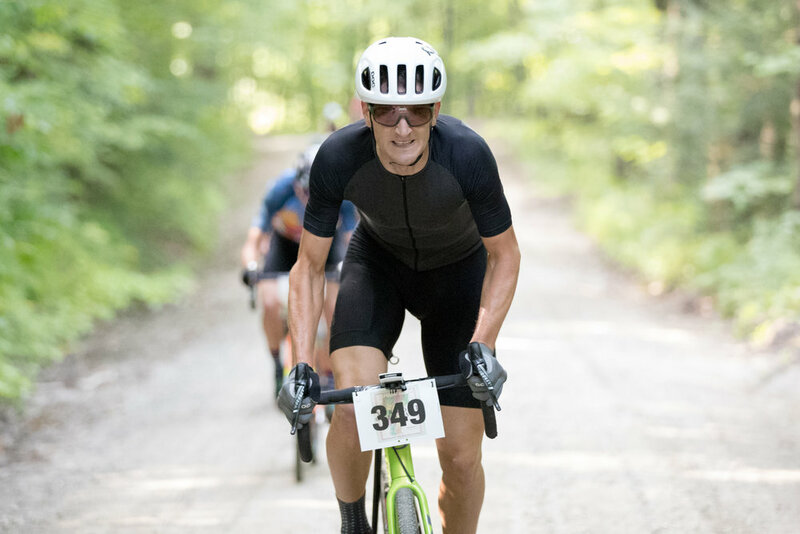 If you are reading this you already know Vermont is blossoming with gravel races that are growing in size, speed, and fun. To me, Rasputitsa and Overland are the crown jewels of gravel racing in Universe. People outside the Northeast may not agree, but they aren’t inside my head. This year was a brand new course starting at Peter’s house. I pre-rode his first edition of the new course and I gave him some feedback. It was basically “How many days did you want people on the course before they finished?”. He shortened it a little and dropped some climbing. Still very hard, but doable. A beautiful mix of pave, climbs, scenery, and nearly no pavement. 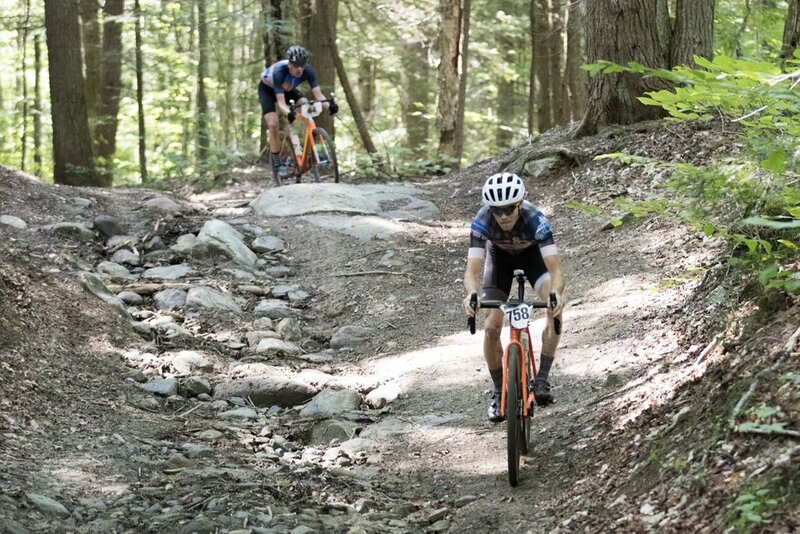 Procured to start hard, offer some rest and beauty, then set the scene for a battle of wills on the best pave in Vermont. I have had a good year to date. Good results across multiple disciplines and I even won Rasputitsa. I am riding better than I ever thought possible (thanks Jacob). So doing well here was a goal. Opposing that goal was the fact that the race is incredible and more and more fast people want to do it. I like to list the people that I fear but the list is always incomplete. A top 20 would be a result anyone could be proud of. I am not great in a pack. I am actually not very good technically either. In fact, I can basically just pedal hard. It annoys me that it is true, I used to scoff at that rider in college, now I am that rider. So despite my first ever call up (people not even there got call ups, so it isn’t as prestigious) I found myself 50 riders back starting the first climb up Jenne Hill. It’s basically a 5 min power test. I was hoping it would go hard and a small selection would happen early, but I didn’t think a single 5 minute or even four 5 minute climbs back to back could do it. Previous years we had a generous warm up section, a long steady climb, and then a brutal pave section. This year we had little time to warmup, sort position, and get balling. You know who was balling from the start? Ansel. I could see his dancing form at the head of the pack pulling the group apart as I was stuck in a sea of agro. He set right to making the pace and the group was shredded. It is actually incredible he took the top 100 guys, many of which were throwing elbows at me seconds before, and broke them in less than 5 minutes. I clawed my way through the group and made it up to Ted and Ansel by the top. Bad positioning is bad for smart riding, but great for KOMs. Ansel pushed it over the top and Ted and I rode steadily behind. Mike Barton and Rally Pro Kyle Murphy were just behind us. The black and neon colors of Brendan Rhim were just barely in sight behind them. Anything after that was out of sight. 10 minutes into the race. The next part of the race was 3 more hard 5 minute climbs with two pave sections. I would like to say more exciting things happened but Barton, Kyle, Ted, Ansel, and myself just rode borderline psycho and somehow Brendan caught us. From there we had 10 miles of rollers and flats and since we had two roadies with us, they attacked. It was surge after surge and finally Brendan got a gap. When he finally got free of us I was doing 600 watts up a roller and I looked at Ted and said “I mean, I am going hard…” Thankfully, we all rolled through and kept him in sight. I was afraid of a bridge but I also loved the idea of leaving him out there. Over the next few miles he did come back and we had a temporary truce on the flats. We got our first time split around then, about halfway through the race, and we had about 4 minutes on the next group. 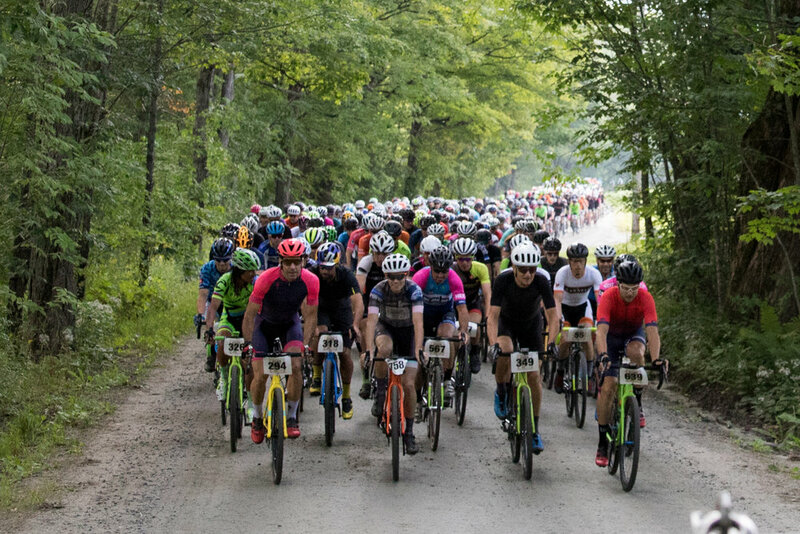 The second half of the course had several long climbs with some kickers and a long pave section with a technical downhill and several steep pave pitches. After that there was more climbing and then some more climbing. Starting the climbing part of the climbing I led the pace, Barton went over the top of me and then Kyle went over the top of that. Ansel and Ted immediately jumped on and I looked to Barton to close the wheel. Brendan started to come off. Barton made an effort to get across but I saw it wasn’t going to happen. I jumped around him and chewed stem to bridge across. This was my hardest effort in the race. I made it on as Kyle continued to surge. I had some dark moments there trying not to come off. In fact, I opened several gaps but fought to close them on any gradient reprieve I got. I knew if I could make it to the pave I would get a chance to rest. Going into the technical pave section I was on Ansel’s wheel with Ted and Kyle behind. Ansel went full send and I did my best to follow. He got a small gap, but Ted and Kyle were starting to fall out of sight. Unfortunately for me, the section ended with more climbing, which isn’t something you will hear me say often. Ansel started to roll away further and Ted bridged up. I stuck his wheel over the top of the pave and it opened up to a dirt road descent. I rolled through and as we got up to speed I heard a bird whistle and Ted went by me at mach ten. In 2005 I did the Tour de Georgia with Ted. 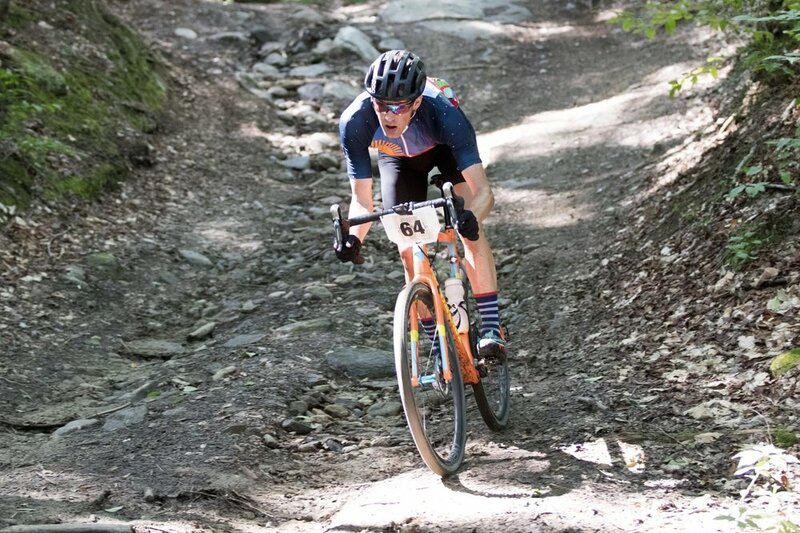 I was in full swing of failing out of the cycling world and was a newly minted DNF at the race. The year before I won the young riders jersey and my parents had come to watch in 2005 and I didn’t even finish. But, at that race, Ted had a terrible crash. I was out of the race and I went to the hospital to be with Ted. It is incredible he had a full career after that race. And here he was, 13 years later, going 50 down a gravel road in Vermont. I hope his mom doesn’t read this. So Ted gaps me and gets to Ansel. I am now dropped headed into the Rasputitsa feed and Kyle is working his way back up to me. Kyle catches me and we then catch Ted and Ansel. Back together again. I joke that Barton is back there still chasing, ***Spoiler Alert***, he was. Fearful of any surges I go to the front and ride the speed I think I can survive at. We do that up the next few climbs and we are setting up for a final showdown. All that is left is Weld Cemetery Road which is a 3 minute climb, some pave, a roller, then the final Pave climb and descent. Boom, Boom, Boom. I hear a yell and a chuckle and there is f*cking Barton. Strava Flybys had him at 2min down at one point. Animal. Earlier in the race Barton and I were leading up a climb with Brendan, Ansel, Ted, and Kyle behind us. I said to him “Hey, we have 4 kids between us, and here we are riding with 4 kids”. Barton doesn’t believe in gears, shifting, cadence, and smashed the climb up Weld as soon as he caught us. Survivable tempo was over and although we didn’t split I don’t think anyone wasn’t suffering. We stay together through the pave and as we approached the rollers into the last section Barton and Ansel led our group of 5. This is where the race was won. I think. In my head I gave up. I was cramping. I was suffering, I couldn’t imagine going hard again. I didn’t believe. So it wasn’t won by me, I am certain Ted didn’t have that negative self talk. Every time I do a race I learn something new. Unfortunately I don’t remember all my previous lessons. Some things have to be learned again. At the 2004 Univest GP, a long and hard European style road race, I had a good result. Bonus fact: A young Tom Boonen was in the race. In the opening half of the race I had missed the front breakaway and as the field shattered I bridged up with John Hamblen. When we caught what was left of the front group I was shattered. He said “good job” to me and I told him that it was for nothing because I was cooked. He told me “Dude, we are all f*cked”. I went on and got second. That resolve didn’t happen at Overland. I should have asked Ted how he was feeling. Back at Overland, going up the last climb I went hard, I suffered, but I was in my own head. Ted led with Kyle, Ansel and Barton just behind, and I was just off them. I had hoped to bridge the small gap on the descent but Ted obliterated it. Kyle got jammed in the mud and I got stuck behind him. Ansel and Barton snuck through and exited the pave 100m ahead of Kyle and me. All that was left was a fast descent, short flat and a finish chute with a little grass uphill drag and a wooden bridge. The day before I pushed my two sons in a stroller up the finish drag 15 times while my wife did the group ride. So I knew it well. Ted went on to win alone. Ansel and Barton came in 25 seconds behind. Kyle and I were 25 seconds behind that. I did my best to get by Kyle on the uphill drag, channeling my stroller power, but on the 100ft to the line after it, I imploded and Kyle got me back. Fifth was my final result at the line, along with two fully cramped legs. Ted gets some crap for not being an all-star technical skills guy, but he made his move on the most harrowing and riskiest part of the race and he nailed it. Woodstock has the Worthy Kitchen and Ted was a Worthy Winner. So that is how the race was won, by someone else. But I really look forward to next year. Going into the race, my good season had started to make me want results and not experiences. My coach Jacob gave me a big reset last month and something he said to me was, to paraphrase: The race is your reward, not the result, tell the story you want to tell, let the goal be the adventure you have. 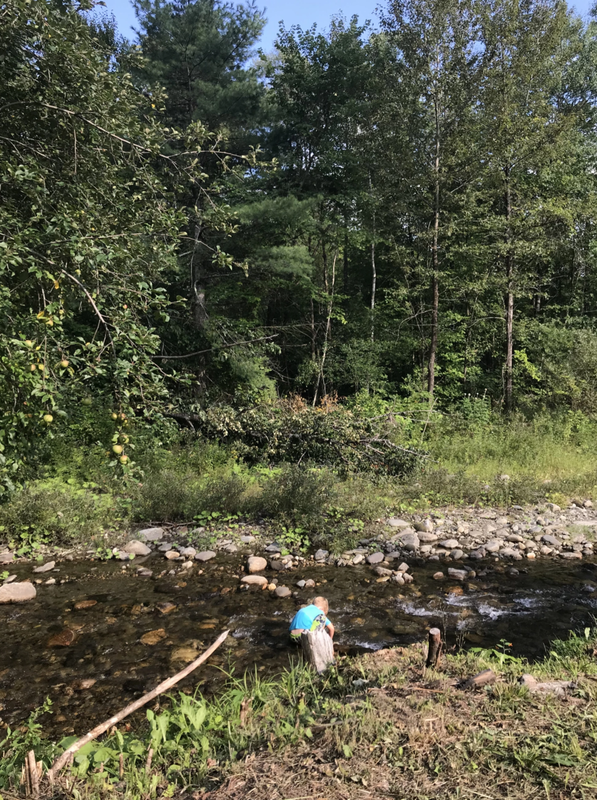 I can always count on the Vermont Overland to provide an adventure worth living.